The highlight of the our island hopping is the hike t Mt. Halla, but we didn't go because of the kids. Its going to be a hard one for them because its a 4 hours hike. But anyhow, one of the Filipinos who went is Kuya Noel. When we were going home he got these boxes of hallabong fruit that he bought for pasalubong. We didn't know that we are one of the recipients of those fruits lol.. Thanks a lot Kuya Noel, you are so thoughtful! 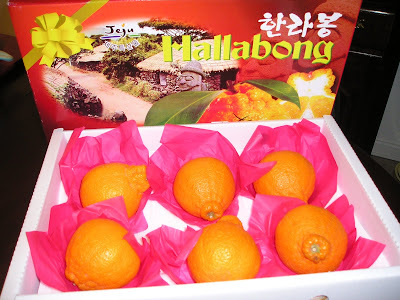 Hallabong are so sweet and juicy!